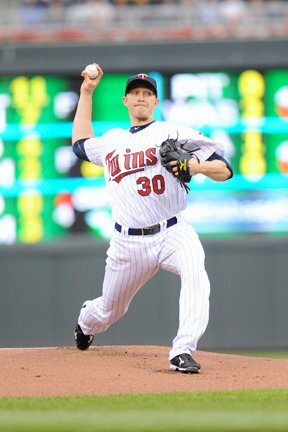 While Michael Cuddyer was the sentimental and eventual choice to represent the Twins in this year’s All Star Game, Scott Baker may be the more logical pick. Baker’s won-loss record of 6-5 won’t wow you, but that’s a symptom of poor run support and a shaky bullpen. A deeper look into the numbers tells the real story. In 105 2/3 innings, the righthander has posted 101 strikeouts against just 29 walks. He’s also limited opponents to 97 hits for a batting average against of .244. Baker’s 3.15 ERA leads the team and he’s allowed more than 4 earned runs just once in his 16 starts (5 on May 11). Every time out, he’s given the Twins a chance to win. The 29-year-old and I hooked up for a quick chat in the sweltering heat before Friday’s rained delayed game vs. the Brewers at Target Field. DZ: You’ve been pitching pretty well this year - especially lately - what’s been working for you? BAKER: I’m getting ahead of ahead of guys just as well as I have in the past, but I think really lately I’ve been making some good pitches ahead in the count and getting some guys to chase pitches out of the zone. I’ve really been making good two strike pitches and everything feels good so far. DZ: You’re from Louisiana, does this heat bother you much or are you used to it? BAKER: You get used to it. I don’t mind it as much as maybe some guys do. You definitely forget - especially the humidity - how brutal it can be and how much energy it can take out of you. You definitely have to take some cautionary measures and make sure you stay hydrated. It’s easy to get loose in it as a pitcher, you just have to make sure you are doing the right thing. DZ: When people talk about pitchers, they always talk about their “stuff” and if they have their “good stuff” on a specific night. At what point during the night you are pitching do you know you have your good stuff ? BAKER: Usually by the second inning. A lot of times, the first inning, you are just trying to get the feel for things and really just trying to throw it over. A lot of times what you have in the bullpen (during warm-ups) doesn’t translate to what you are doing out here - good or bad. You might have a terrible warm-up and come out here and do fine or you might have a great warm-up and you come out here and they’re hitting it all over the place. I’d say the second inning you are starting to see more consistently what your stuff is doing and you make the adjustments when you need to. DZ: Do you ever have games where maybe you don’t feel so good in the second inning and then later on something clicks? BAKER: At some point in every game you have to deal with some type of adversity - for me mechanical things that aren’t going right. It’s just a matter of making that adjustment during the game - that’s the most important thing. You are always going to run into some trouble…(it depends) on if you can make that adjustment or not - sometimes you do, sometimes you don’t. That changes the outcome of the game. DZ: When the pitching coach comes out (to the mound), what are those discussions about? Are the mechanical or to lighten the mood? What is the general topic during those? BAKER: For me a lot of it is mechanical. Part of it is the situation, a lot of times you are literally one pitch away from being out of an inning - I know it kind of feels crazy. Andy (Rick Anderson) does a good job slowing it down a little bit for you, allowing you to catch your breath and just kind of refocusing your efforts to do the best you can with that next pitch. DZ: You’ve been in the league over six years know. This is your 7th season, I think. What do you know now that you didn’t when you first got up here. What’s the biggest thing, I am sure there are a lot of them? BAKER: Like we talked about earlier, just being able to make that adjustment during the game. I had some great games early in my career - pretty dominant performances - but there were other times where I’d run into trouble and I couldn’t get myself out of the inning…We all know that in order to succeed in this game, you have to stay away from the big innings. I think that’s the biggest thing - slowing down, re-gathering yourself and allowing yourself to make the best possible pitch in that situation. Really break it down, one pitch at a time. DZ: Going back to last year, you didn’t get a spot in the rotation during the playoffs, did that provide any extra motivation for you going into the offseason? BAKER: No (pauses), I would hope that anybody would go out there and give their best effort regardless of the situation they are in. If I were to say that I went out there and worked harder or tried harder, that’s just not true. I hope that everybody is trying their best regardless of the situation they are put in. I am going out there and do the best I can and if I make the rotation I do, if I don’t, I don’t. I know that I am going out there and giving my very best. DZ: You guys have been playing better the last month or so - had really good hot streak going for awhile - but, going back to the first two months of season - being a starting pitcher, you are a spectator for a lot of games. Was it strange watching the team lose as much as they lost? They’ve never really done that (during your time here). BAKER: For the six or seven seasons I’ve been here, we’ve never experienced that. The closest thing I’ve ever seen was ‘05 when I first got called up. I was so excited to be up here that a lot of the stuff wasn’t relevant at the time. It’s very easy to feel sorry for yourself and be down on yourself and on the team, (but) nobody is going to feel sorry for us. We’ve done very well in this division and it’s just a matter of getting back to basics and realizing that we can play some good baseball. It’s one game at a time - keep it simple. DZ: One last thing, as a baseball player you are always working this time of year, but what do you typically try to do on the 4th of July? BAKER: We’ll catch some fireworks with our two little boys, whether it’s here at the stadium or we live out in Maple Grove and they always have a nice fireworks display. Just spend time with the family, enjoying my wife and two boys. Obviously we don’t get a ton of time during the season, but the time you do, you want to make sure you are there mentally and physically. This entry was posted on Sunday, July 3rd, 2011 at 8:22 pm	and is filed under MLB, Twins. You can follow any responses to this entry through the RSS 2.0 feed. You can leave a response, or trackback from your own site.